When the playhead is on top of a single track but the track is not selected, I think that Ctrl + Shift + D should still slice the track because there's no ambiguity. For me, much of the convenience of the keyboard shortcut is negated by having to first use the mouse to select the track. Good point. This is where Composite Shots come in. Maybe combining Composite Shots would help. What if you have multiple video tracks? There are times when you may have two to three video tracks. Especially if you're doing L or J cuts. What's one extra click? I mentioned this is some other forum thread but why not place it here. It would be nice if grade layers could have composite children. A hierarchy (child sublist)(nested layer order). If you know Vegas then think that way. Obligatory Vegas screenshot for visual reference. Track 2 is a child of 1. 2 is comp'd with 1. 1 after comp'd with 2 is comp'd with 3. The nice/flexible thing about grade layers is that they affect everything below. The bad/inflexible thing about grade layers is that they affect everything below. Like Palacono stated above we are effectively limited to a single grade to flatten at any given timeline position. Even if only grade layers could have children then that is enough. Of course nested comps give us this ability. This can be fiddly/tedious bopping back and forth between various open comps but worse is that we cannot share a point/track/whatever across those comps. Functionally, Hitfilm already has to implement this layer order nesting with the referenced comp feature it already has. Where a referenced comp layer is effectively a sublist of layers to be rendered. 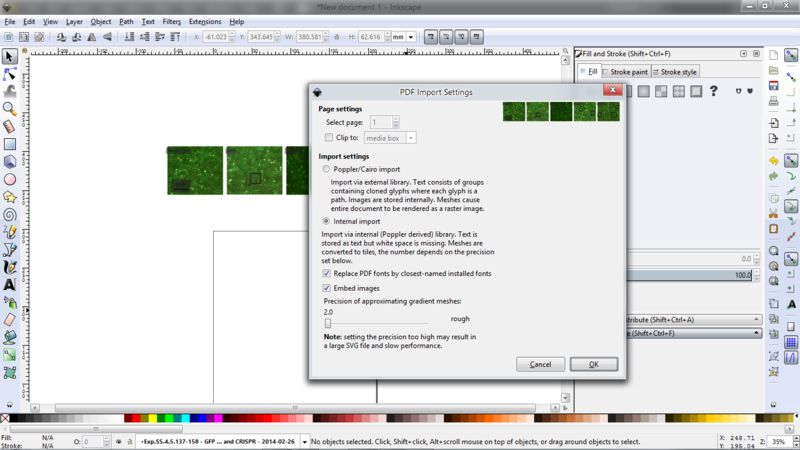 At a minimum allow grade layers to have composite children. Full flexibility would be let any layer have comp children. With a hierarchy available a layer stack can get more of the dependency flexibility of nodes. That's why I explicitly said "when the playhead is on top of a single track". Obviously, when the playhead is on top of more than one track, the behaviour remains the same as it does presently. There's no point at all in a keyboard shortcut that you need to use the mouse to enable. It's more effort than just using the mouse to right click on a clip and choose slice. When adjusting the timeline scale using Ctrl + mousewheel, the increments are too large. I wish for much smaller increments. +1,000,000 For a logical/useful NLE timeline zoom scale. Hey, could Hitfilm please try to load .MOV files using the internal AVC decoder before trying to use Quicktime? 1. Quicktime is no longer supported on Windows 10, and even when hacks allow it to be installed (e.g. : Quicktime Alternative), I believe there are security issues. 2. There is a not insignificant performance hit if you use the external Quicktime decoder. +1 On that (quicktime bypass). Been flapping my lips on that since HF3. @NormanPCN - I have to thank you, because it was one of your posts put me onto this - I was very happy with the performance improvement just from renaming .MOV files to .MP4 - opened a DOS window and did "rename *.mov *mp4". I then opened the project as a text file (xml ftw!) and did a search and replace of MOV to MP4 and it opened fine in Hitfilm but with better performance. Was looking for the post I saw to thank you but couldn't find it, so anyway, kudos to you mate! The Luminance Key Effect to have a Source Layer: [dropdown] option added to it. Trying to replicate it involves combining two (or is it three?) other effects and a Grade Layer (or an Embedded Composite) and one of the effects doesn't work "properly" at the ends of its range IMO (I'll make a video about that at some point). 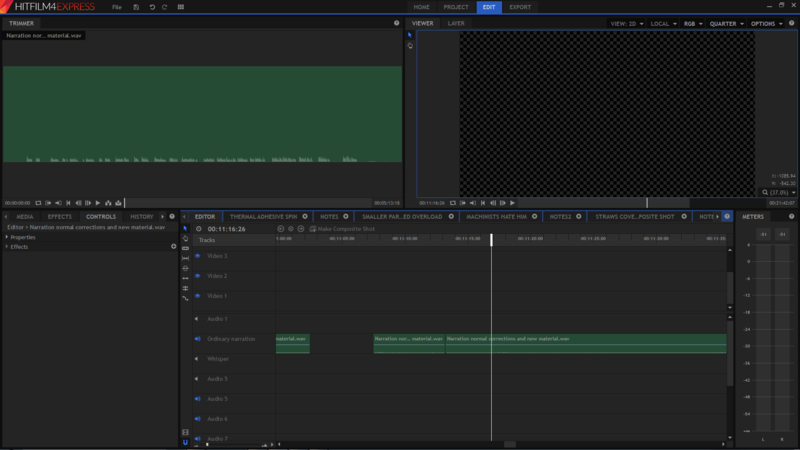 It would be great if there was better AMD support,more audio mixing features in express, and if you could mask in the normal editing timeline without having to make a composite shot that would be great! The point of the Editor side of Hitfilm is to focus on dialogue, sound and storytelling. Switching between compositing and editing requires very few actions. There are very few times in editing where you're only going to mask a shot. You're complicating the editing process by imposing vfx in the editing interface. You're not saving much time by wanting to mask footage while editing. @ToddGroves unless you want to use the mask tool to make transitions. So without having that on the editor timeline it makes it a pain. I like @Triem23 's Widget/Toggle idea. I'd rather use the rotation on the widget for animating more than for just the set-up orientation. @ToddGroves- quite an impressive list of jobs you've done! Have you ever dove into ZBrush? That was my main focus for the 6 years prior to Hit Film. Still coming to grips with all the ins and outs of importing my own models into Hit Film. Hmmmmm... since we have two active threads this morning where a user's project has corrupted, I'm wondering if the auto-save system can be tweaked where an autosave renames the previous autosaved file to >projectname<.hfp.bak so that if a primary project file gets corrupted, hopefully the previous autosave is still intact? i recently started using ZBrushCore. I wanted to get the hang of using its basic tools before upgrading to ZBrush, since it's an $800 investment. For $149, I got a Wacom 3D intuos tablet and ZBrushCore together. I'm still practicing with it. Besides creatures I can see how it can help me create all kinds of organic objects, etc. in the meantime, I'm enjoying working with it. Ah, I see. Yes, you can make all kinds of interesting transitions with a masking tool. Good point. The ability to set a path to one's LUTs or have the program remember the last time a LUT was used and default to that directory/path. Currently LUTS default to the desktop. The most annoying thing for me is the sluggish response when moving the playhead in the timeline in complex composites. An almost instant and useful reaction to my input would be the most important thing. I could live with the more complex effects appearing after a slight delay. While this is not easy it should definitely be possible (make the layers that take most of the rendering time invisible or use a simplified version while you are scrubbing - return to the complete version as soon as you don't move the playhead anymore). Another detail that is annoying: When modifying masks the release of the mouse button sometimes is detected to late - the button is already released by the point still moves with the cursor. I, too, have that experience with masks. Support for XAVC format. And for now, before that is or even if it will be a feature, what do I do with my XAVC files to edit them in Hitfilm. With minimal or no quality loss. Please leave whether there is quality loss next to the suggestion. I will generalize the XAVC support request to AVC 4:2:2 in general and support for 10-bit. Not just proper XAVC in MXF. MP4 files and maybe quicktime bypassed MOV. The GH5 is delivering this now and it is quite affordable. Other DSLRs have 422 AVC available. I have copied a version of mc_bc_dec_avc.dll (9.10.12.8993) from Vegas 14 into the Hitfilm install folder. * The ability to crank up the audio a lot more than today. * Sliced elements which belonged to the same element before being sliced should automatically be linked together for adjustments like audio level. However, one should also be able to unlink chosen elements. More motion graphics stuff. I think HF is geared more towards VFX, which is not a bad thing, but things like Ae's Trim Path, shapes, better text animation, and so on would be nice. Pressing CTRL or ALT or whatever other key for precise adjustments. For the Grading Transfer Effect to generate data that could be used and saved as preset values (not a 'Hitfilm' Preset), as it seems to be doing a lot of work on every frame, which has speed implications. Once calculated on a single frame, the preset values could be saved, then the Effects focus changed to use those (named) values from a dropdown. This is how several BCC Effects work, with a 'Setup', then a 'Use' pass. Or, even better: for it to generate some Curves, Histogram, Color Corrector, Hue and Saturation, or whatever else it does, as standard Hitfilm Effects on the layer, with the appropriate values ( and nodes for the curves in Curves) in place so that you can save those Effects together as a normal Hitfilm Preset block and apply them to something else later by putting them on a Grade Layer. You would also then have the option to tweak the values yourself to get it closer still, or slightly different, without having to try and recreate everything from scratch with those standard effects yourself. Grading Transfer could therefore become more of (or be supplemented by, as a separate Effect:) a Grading Values Creator.